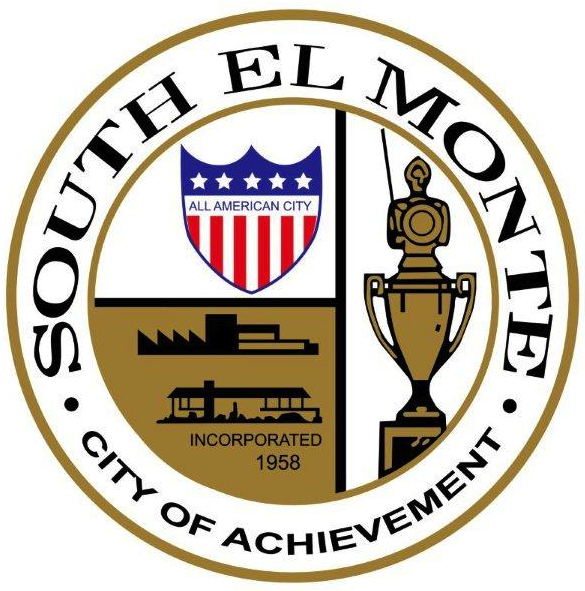 The official seal of the City of South El Monte bears the words “City of Achievement.” Pictured on the seal are a golden trophy, a shield reading “All American City,” and the silhouettes of a factory and a 1950s-style ranch house with the legend “incorporated in 1958.” At a glance, this seal seems generic. Thousands of cities and towns, not just in greater Los Angeles but all across the United States, incorporated in the two decades after World War II. Nearly all of them were founded on a combination of industrial and residential development in the suburban areas around major cities, and they all claimed to be “All-American” communities. The founding of South El Monte took place in the context of these regional and national transformations, but the history of this “City of Achievement” is also a unique story of local organizing. Residents of the area fought to found their city against the expectations of regional planners, and they worked tirelessly to bring the benefits of postwar metropolitan growth to their working-class community. Faced with challenges of racism, inequality, and poverty, the people of this diverse city came together to improve schools, medical care, employment prospects, and recreational opportunities for their neighbors. Their efforts did not go unnoticed: the city received several national awards for civic involvement in the first twenty years of its existence. This entry offers a brief glimpse of some of the many ways that the people of South El Monte achieved their city. “They practically laughed us right out of that office,” remembered Blanche Felix in 1977. She and a local factory owner had gone to meet with representatives of the city of El Monte in the early 1950s to discuss annexation. At the time, South El Monte was an unincorporated area of Los Angeles County. Thousands of residents lived in the colonias in the area, but without an incorporated city government, they did not have adequate police protection, trash pickup, or other services. Felix hoped that El Monte would annex the area, as it had many others, but the reply she received was “that area was only fit for chickens.” The regional Zoning Board had designated South El Monte “an agricultural area that actually nobody wanted,” including the city to the north. Felix was not deterred. After “two years of fighting every inch of the way,” she and several other community leaders won an industrial rezoning of the area in 1955. Residential developments began to grow as well, even without county support. Beatriz Perez, whose father supervised some of the drainage of South El Monte for development and sewer construction, remembered that her family and others “weren’t allowed to buy property in El Monte … the way the deeds read, no Mexican people could buy no mas … not even Japanese.” In response, her father bought ten acres of property on Loma Avenue and Fawcett Avenue. “He put up his own streets, his own lighting. He paid for everything,” Perez recalled, and then sold lots for houses “just to show them that we could have just as nice houses as anybody else.” Having been refused by El Monte, they decided to incorporate on their own. In 1958, residents voted to become a city by a two-to-one margin, marking the first of many achievements: the creation of South El Monte. The segregation of suburban spaces by race and class did not go unchallenged. Frank Lara remembered “the Second World War did change a lot,” as returning soldiers sought the democracy they had fought for abroad in their own communities. Joseph Vargas, who helped incorporate South El Monte, also cited the influence of the Civil Rights Movement. Vargas held up his own life as an example. He had come to South El Monte in 1927, when “discrimination existing in this area was rampant,” and had caused a scene in El Monte just after the war by threatening to sue a pool hall for posting a sign that read “No Mexicans Allowed.” Years later, he marveled that “from this extreme set-up” he was elected to lead South El Monte in the early 1960s, becoming the city’s first mayor of Mexican descent. Equally important in these years were the efforts of lesser-known residents. Mothers like Blanche Felix and Beatrice Perez joined PTAs to demand quality education for their children, while teenagers created what scholar Matt Garcia calls “an alternative body of cultural and political expression” when they challenged geographies of exclusion by gathering at integrated rock-and-roll venues like El Monte’s American Legion Stadium. South El Monte’s diversity also influenced the path the city chose. Scholar Wendy Cheng interviewed Latino/a and Asian-American residents of the western San Gabriel Valley and found that their experiences navigating the racial hierarchies of the housing and job markets in the 1950s “did not usually translate into a commitment to the exclusionary mandates” but instead led them to “articulat[e] relationships to property based on distinctly antiracist, non-white identifications.” South El Monte was, from its inception, a “majority-minority” city, and many of its people had experienced exclusion firsthand. They did not want to reproduce these inequalities in their new hometown. City leaders embraced the Mexican heritage of many residents, hosting annual fiestas to celebrate the city’s birthday at Joseph Vargas’s ranch in the early 1960s. The South El Monte Industrial Lions Club hosted the leader of Mexico’s Lions Clubs in 1965 at a joint celebration of community education efforts. A few years later, city leaders returned to Washington to collect another award, this time from the Town Affiliation Association. South El Monte had initiated a friendship with the city of Gomez Palacio in the Mexican state of Durango that persists to this day. In 1968, they won “the most outstanding sister city project of 1968” for “obtaining a fire engine” for their sister city. Reporting the achievement, the Los Angeles Times noted that it was the sixth national recognition for the city that no planner had expected. Unlike its wealthier neighbors, South El Monte did not have the resources to lure businesses with material incentives, but the city’s commitment to community involvement attracted many successful people. Dentist Pete Nunez was born in Calexico and spent his youth migrating to Fresno and Merced in the summers with his farmworking parents. After returning to school to earn a degree in dentistry at USC in 1973, he decided to practice in South El Monte, where “there was no dentist.” As he explained in 1977, “my goal is eventually to set up the whole corner [where his office was located] as a dental center for this community.” After choosing South El Monte, Nunez “got involved in school activities,” giving free dental exams to local children. As Ledesma’s story demonstrates, South El Monte and El Monte both faced new challenges in the late 1960s and early 1970s. The headlines of the Los Angeles Times’ annual forecasts charted this change, as cheery prognostications of continued growth gave way to predictions like “Valley’s Way of Life to Be Altered in 1969: Freeway Jobs Top List; Drug Use, Blight, Segregation, VD Are Targets for Eradication.” At the local level, suburban growth slowed as the San Gabriel Valley matured. Cities that had once expanded their tax bases through constant new construction and annexation now faced the prospect of either raising taxes or cutting services, while the workers who had built these freeways, factories, and houses faced layoffs and prolonged unemployment. These local challenges were compounded by the stagnation of the national economy during the 1970s, which led to cuts in federal funding for cities, and particularly funding for social services. While South El Monte’s working-class population was particularly hard hit by rising unemployment, local residents continued to organize, and the people of El Monte who now faced similar challenges, joined with them in greater numbers than ever before. South El Monte and El Monte share a school district, and many residents concentrated their efforts on improving local education. Valle Lindo High School, where Ledesma was a counselor, was one focal point of these efforts (the school was later renamed for Ledesma). A high school for students who “have become disciplinary problems in their regular classrooms or have to work part time to support their families,” the school also served adults in the community with night classes, and people from all walks of life worked to support it. The Rotary Club of South El Monte created a “business buddy” system to generate jobs for students at the school. In an acknowledgement of his community work, the principal of the school, Martin C. Montano, was hired as the consultant for Mexican Affairs by the Pomona Unified School District after La Raza Unida de Pomona threatened a student strike on account of the district’s lack of Mexican staff (La Raza described Montano as “the best pick”). After he departed, the school continued to innovate, offering pre- and post-natal care to young mothers in 1971, and adding a day-care center for students with children, staffed by community members, in 1976. It was in this context – facing great challenges and meeting them through community organizing – that South El Monte won yet another award in 1975. As the Los Angeles Times reported, “Involvement of residents in efforts to cope with such problems as juvenile crime and a lack of health and childcare facilities has earned South El Monte an All-America City Award” from the National Municipal League. 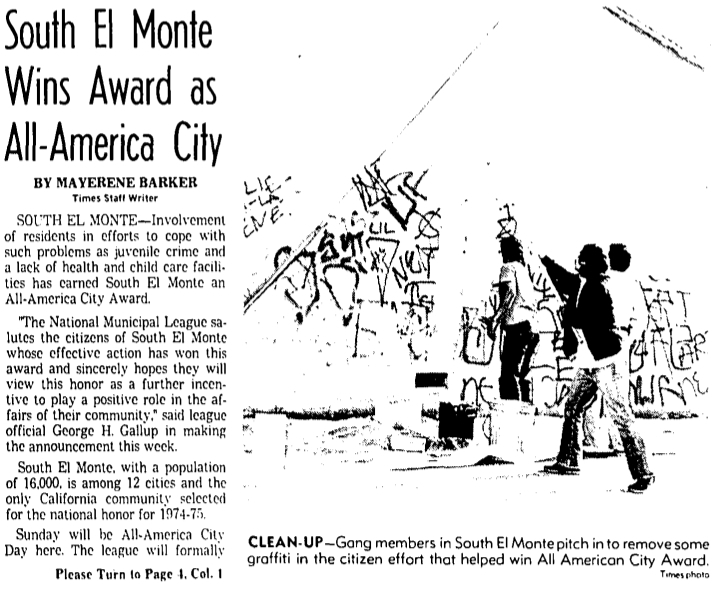 One of 12 cities selected across the nation, and the only one from California, South El Monte was honored for several programs, including Pete Nunez’s free dental clinics, and particularly for “the involvement of residents and the volunteer leadership.” The photo that accompanied the article pictured members of the local Flores gang painting over graffiti. South El Monte was not without many problems – as the article noted, it had the highest school dropout rate, the fewest doctors, and the highest crime rate in the area – but the city’s diverse, community-oriented response to these problems continued to win national awards. Apodaca, M. Linda, “There Is Nothing as Gentle as Strength, and Nothing as Strong as Gentleness: The Life and Times of Felicitas Cordova Apodaca, 1912-1997,” Frontiers: A Journal of Women’s Studies 20:1. January, 1999. Brilliant, Mark. The Color of America Has Changed: How Racial Diversity Shaped Civil Rights Reform in California, 1941-1978. New York: Oxford University Press, 2010. Cheng, Wendy. “The Changs Next Door to the Diazes: Suburban Racial Formation in Los Angeles’s San Gabriel Valley.” Journal of Urban History 39:15. November, 2012. __________. The Changs Next Door to the Diazes: Remapping Race in Suburban California. Minneapolis: University of Minnesota Press, 2013. Garcia, Matt. A World of Its Own: Race, Labor, and Citrus in the Making of Greater Los Angeles, 1900-1970. Chapel Hill: UNC Press, 2001. (particularly chapter 6). Obler, Susan Sellmen, Ed. Personal Stories from the El Monte Communities: A Project of the Exploratory College. Whittier, CA: Rio Hondo College, 1978. Self, Robert O. American Babylon: Race and the Struggle for Postwar Oakland. Princeton: Princeton University Press, 2003. Blanche Felix interviewed by Jane Perry and David Rocha, Personal Stories from the El Monte Communities Susan Sellman Obler, ed. (Whittier, CA: Rio Hondo College, 1978). Robert Self, American Babylon: Race and the Struggle for Postwar Oakland (Princeton: Princeton University Press, 2003). Mike Castro, “Thirteen Schools in El Monte Cited as Imbalanced” Los Angeles Times, Nov. 28, 1971. Matt Garcia, A World of Its Own: Race, Labor, and Citrus in the Making of Greater Los Angeles, 1900-1970 (Chapel Hill: UNC Press, 2001). “Mexican-Americans May Shun Integration Drive” Los Angeles Times, August 9, 1963. Lorraine Barnes, “Mrs. LBJ Makes Awards” The Washington Post, February 16, 1966. Fernando Ledesma interviewed by Tony Estrada and Greg Hoard, Personal Stories from the El Monte Communities (Whittier, CA: Rio Hondo College, 1977). John Grover, “Valley’s Way of Life to Be Altered in 1969.” Los Angeles Times, December 29, 1968. Peyton Canary, “Rotary Project to Help Continuation Graduates.” Los Angeles Times, June 13, 1969. “Valle Lindo Principal Named Mexican-American Consultant.” Los Angeles Times, June 25, 1970. “Pregnant Girls Get Special Aid” Los Angeles Times, April 2, 1971; “School Nursery Helps Mothers – Fathers, Too” Los Angeles Times, February 12, 1976. “PICA” is short for “picar,” meaning “to poke” in Spanish. Mike Castro, “STUDENT POLARIZATION FEARED.” Los Angeles Times, June 1, 1973. Mayerene Barker, “South El Monte Wins Award as All-America City.” Los Angeles Times, April 17, 1975. “Thousands of residents lived in the colonias in the area, but without an incorporated city government, they did not have adequate police protection, trash pickup, or other services.” This raises an interesting question about statesmgoing with a County / City / Unincorporated areas model or arbitrarily dividing up unincorporated areas into Townships so everyone has a local government representing them. I’ve personally always disliked the idea of townships as they are simply drawn up by government with no real correlation to growth of an area, but there needs to be a balance between that and simply leaving people in unincorporated areas out to dry.